Des Moines Register calls for Iowa Democratic caucus audit. Democracy in action. 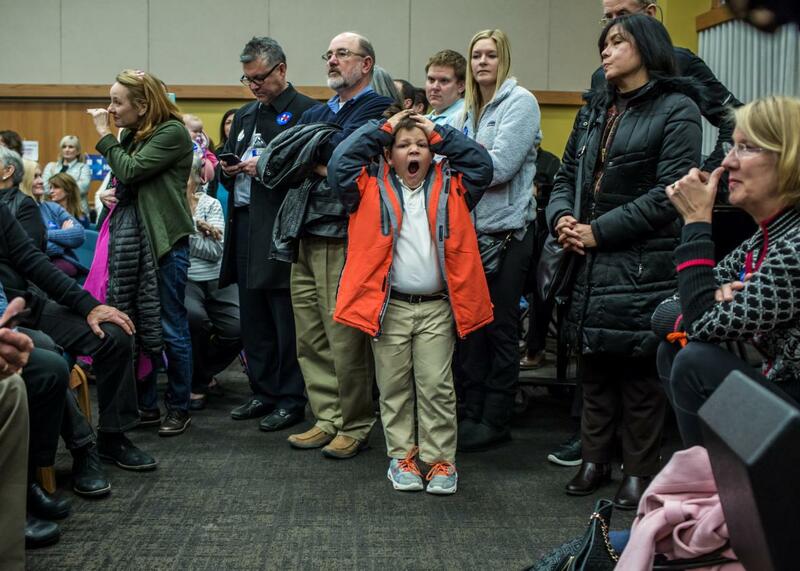 Above, 8-year-old Federico Oliphant yawns during the Democratic caucus in a West Des Moines precinct on Feb. 1, 2016. Bernie Sanders supporters aren’t the only ones unhappy with how Monday’s Iowa caucus unfolded on the ground. The Des Moines Register’s editorial board on Thursday lent its voice to the cause, calling for the state Democratic Party to complete a full audit of the results, release the raw vote totals, and then organize a blue-ribbon commission to figure out how to improve the process moving forward. The paper isn’t alleging any intentional wrongdoing on the part of the state party, instead simply suggesting that its leaders should feel obligated to address a number of questions that arose during an arcane process that appeared to come apart at the seams on caucus night. “Too many accounts have arisen of inconsistent counts, untrained and overwhelmed volunteers, confused voters, cramped precinct locations, a lack of voter registration forms and other problems,” the editorial said. “Too many of us, including members of the Register editorial board who were observing caucuses, saw opportunities for error amid Monday night’s chaos.” The historically tight finish—Clinton edged Sanders by one-third of 1 percentage point—and the fact that Bernie isn’t exactly beloved by the party establishment only add to the urgency of an audit, the paper argued. The state party has so far refused to budge on the issue of further transparency and says that the current results will stand. For its part, Team Bernie is not formally contesting the results, though it says it is doing everything it can to double-check the official tallies with its Iowa staff. The campaign has also called for the state party to release the raw vote totals—something it typically has not done. Unlike the Iowa GOP caucus, which is relatively straightforward, the Democratic version involves caucusgoers physically arranging themselves around a room in order to signal support for a candidate. The process can be time-consuming and incredibly chaotic—and occasionally end in a coin toss. (Meanwhile, since caucusgoers can shift their votes to a second candidate if their first choice doesn’t reach a certain threshold, the raw vote totals might tell us different things depending on during which round they were recorded.) At the end of the night, each precinct then divvies up a predetermined amount of county delegates between the eligible candidates, and those delegates are then translated into what are known as “state delegate equivalents.” (The county delegates go on to select state delegates at a later date, and those delegates ultimately select yet more delegates for the national convention.) So, uh, yeah, it’s confusing. Interestingly enough, Sanders and Clinton both have a case that they were short-changed by the caucus process itself. As I explained on Tuesday, Sanders may have been hurt by the fact that the number of delegates assigned at each precinct is based on turnout during the past two general elections, not on how many people show up on caucus night. A precinct with seven county delegates, awards seven county delegates regardless of whether seven people show up to caucus or 700 do. Given Bernie’s support appeared to be more concentrated around college campuses—while Hillary’s appeared more evenly spread out across the state—it’s possible that he didn’t feel the full benefit of his passionate young fans as a result. FiveThirtyEight, meanwhile, found some evidence to suggest that Clinton was doing better relative to Sanders before the resorting process that occurred in all the precincts where Martin O’Malley failed to reach the minimum support. Those arguments, though, are based in a hypothetical world where the Iowa caucus process is itself different. The concerns being rightly raised by the Des Moines Register are based in the real world where there are legitimate reasons to doubt that the process played out as it was supposed to according to the system that is in place. So, it’s fair to wonder: Would the Iowa Democratic Party be as confident in its final results if they would have shown Sanders with the narrow lead as opposed to the other way around?